This is a tale of neglect and obsolescence. Julian Baggini didn’t have room for his Encyclopædia Britannica. The thirty-two volumes represented his parents’ hopes and dreams for him, but now that he was all grown up they were no longer of any use—if they ever were. They went into storage until one day he discovered that they had gotten wet and were now covered in mold. The only thing left to do was to dispose of them. He chose to burn them. It’s a provocative act—I think we all have a negative gut reaction to book-burning—but he sees it more as a cremation. 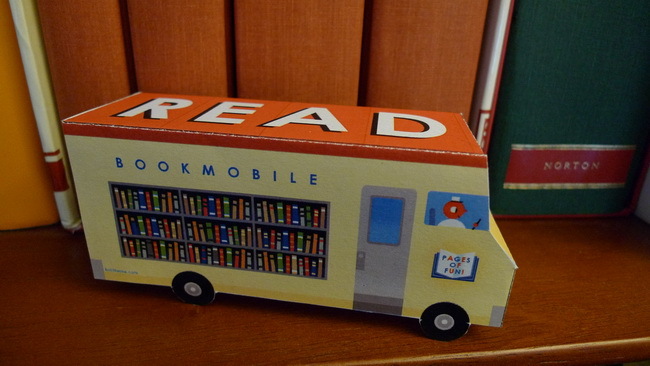 The books died long ago, and perhaps had never truly lived. While carrying out this last duty to these great books, Baggini wonders if they ever served their intended purpose, or if they were simply a marketing trick, preying on the aspirations of working class families who wanted a better future for their children. Did anyone really use them? My parents couldn’t afford a set of encyclopedias, or rather, they chose to take me to Europe instead. Baggini suggests that parental influence is far more important to later success, and that parents could have done more for their children’s education, without going into debt, by buying plain old good books. I must admit that as a child I lusted after the Encyclopædia Britannica. A few years ago, when I found it drastically marked down on Amazon, I jumped at it. It was the fulfillment of a childhood dream, and the thirty-two volumes sit proudly behind me as I type this. Do I use them? Rarely. But that doesn’t make them worthless in my eyes. I think it’s worth having tangible symbols of the things we believe in, especially now that so much of our lives is virtual. I think the next generation is more comfortable living in the cloud, but I like to be able to hold the things I care about, and you can’t get a more substantial symbol of carefully collected knowledge than the Encyclopædia Britannica. It is not only Baggini’s set of EBs that have passed on, but Britannica finally stopped producing print editions last year. So let us bow our heads, and mark the end of an era. You can also see Julian Baggini’s written account here. 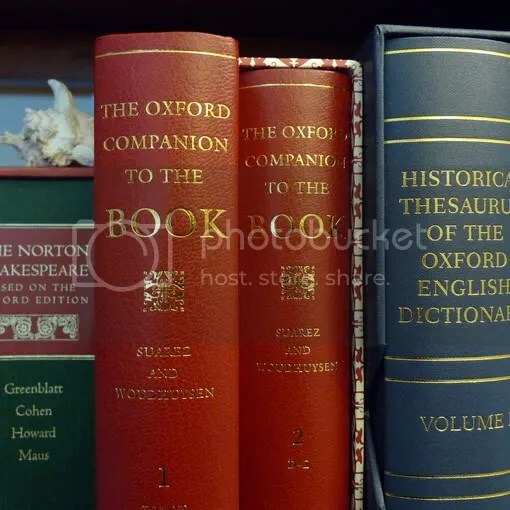 Oxford University Press has recently updated its OED Online website and added the contents of the monumental Historical Thesaurus of the Oxford English Dictionary (which I blogged about before). It’s quite amazing that a reference work that took over 40 years to create can be put online in one year. Many public and school libraries have Oxford Online subscriptions, and you may be able to access it through your library’s website. Otherwise it costs about as much for a one-year subscription as to buy the gigantic two-volume set. It doesn’t seem to be available to buy in digital format, but perhaps that is coming later. I must confess that the books are very large and heavy, and the (necessary) semantic organization makes finding words a bit slow, so frequent users would probably find an electronic version much more convenient. For something a little lighter, try Save the Words, a quirky web page from Oxford Dictionaries. It presents a cornucopia of worthy words in danger of extinction who are (audibly) begging to be adopted and saved. It’s great fun for all the linguistic inveteratists out there. Étendue d’eau reposant dans une cuvette à fond imperméable et généralement moins vaste, moins profonde que le lac. →bassin, mare, réservoir. Étang naturels et étangs artificiels (creusés de main d’homme). «Le soir je m’embarquais sur létang, conduisant seul mon batea au milieu des joncs et des large feuilles flottantes du nénuphar» (Chateaubriand, Mémoires d’outre-tombe). Assécher, curer un étang plein de vase. Les rives, les chaussées, la poêle, le déversoir, la décharge d’un étang. Étang poissonneux. Villon, Testament, «Ballade des dame du temp jadis». A while back I blogged about the wonderful world of Larousse encyclopedic dictionaries. As I continued to delve into the world of French dictionaries I discovered, or rather rediscovered, Larousse’s main competitor, the house of Robert. I now recall seeing the Petit Robert dictionary on the desks of some of my French Immersion teachers, with it’s plain white covers and dense text—not too appealing to a young person. 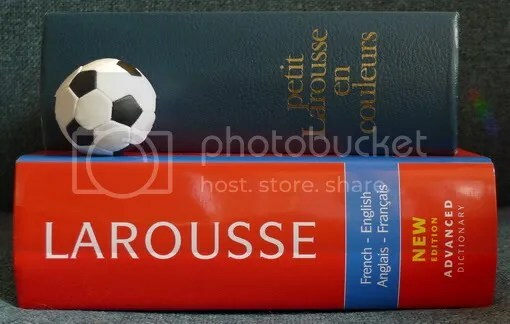 Larousse has traditionally geared itself towards children and families, with lots of colourful illustrations, and both common and proper nouns in the same volume, though in separate sections. Robert, on the other hand, is a more technical dictionary in two volumes (common and proper nouns separated), with more etymology and more extensive definitions, suited to the older student, professional, or translator. 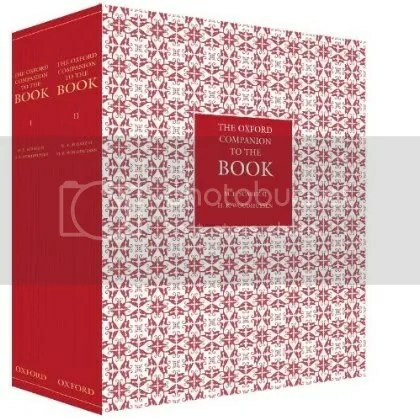 Though Larousse is certainly progressive, Robert has traditionally been thought of as the more modern and up-to-date of the two publishers, and their most recent dictionaries live up to that reputation. 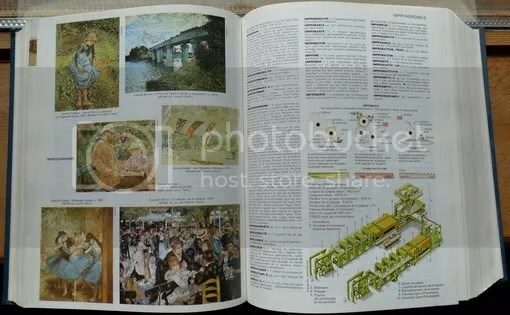 First is the Dixel, their new annual illustrated encyclopedic dictionary (see sample pages here). It might seem to be in direct competition with the Petit Larousse but it does have some significant differences. First of all, common and proper nouns are listed together, with differently coloured headwords to distinguish them. This enables the reader to get a more complete appreciation of how a word is used without having to look it up twice. The publishers also tried to make the illustrations and sidebars relevant to today’s world. For example, instead of a generic spread on the world’s mammals, they have one on endangered species. The Dixel also uses photographs of famous people doing what they were famous for, instead of just a head shot. It’s a subtle difference but it reflects a philosophy of making knowledge active and connected to reality. A far more significant publication is the Dictionnaire culturel en langue française (see sample pages here). This unique and monumental work is the brainchild of Alain Rey, who also edited the Dixel. It is not merely a dictionary, but a cultural dictionary, which means that in addition to giving you the technical meanings of words, it also strives to give a sense of their cultural connotations and symbolism. It’s an embodiment of the interconnection of language and culture—what words mean, to a particular people, is connected to their ideas and cultural expressions. Consequently, the Dictionnaire culturel includes quotations showing the use of words in a beautiful, literary way, not just a catalogue of historical uses in any form as in the Oxford English Dictionary. Furthermore, it does not explain the cultural significance of words in French or European culture only, but in other cultures as well, and throughout human history. As a final touch, the 9,600-page, 4-volume set is enclosed by a Plexiglas box, which is meant to signify clarity of understanding and letting the reader make of their language what they will. Fabulous, non? Alain Rey’s philosophy is that a proper knowledge of language is fundamental to any kind of work. This connection between language and what people do is what makes his dictionaries different. 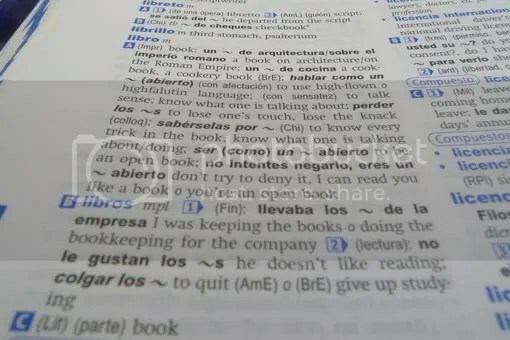 Dictionaries have a tendency to handle language as though in a historical vacuum, which is understandable for reference books that are intended for years, if not decades of use. 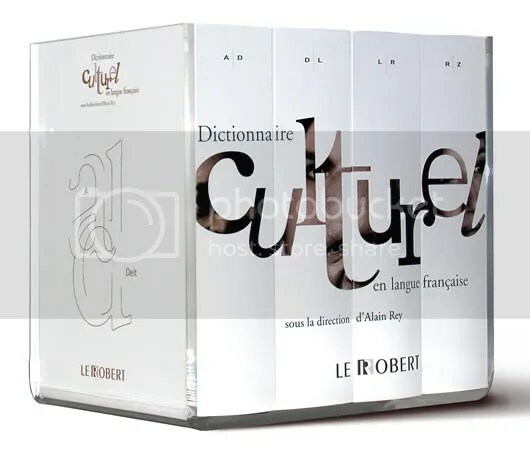 But with annual dictionaries like the Petit Larousse and Dixel, and even the Dictionnaire culturel, there is more liberty to connect language with its cultural context, and thereby to bring language closer to the real life of today. I for one am very excited by this, and hope this passion for correct, creative, living, and working language catches on in the English-speaking world. Bravo, M. Rey. Les dicos plus à la page que jamais. Larousse vs Robert, quel dico choisir? Inspired by Spain’s World Cup victory I’ve been working on my Spanish lately. Thanks to the wonders of modern libraries I was able to download a set of audio lessons to my mp3 player and now have an idea of how to ask when the train leaves for Madrid (or better yet, Camp Nou). I’ve also been bravely slogging through websites in Spanish with the aid of the handy aFCA translation add-on. However, no learning enterprise is complete without a trip to the (virtual) bookstore. My old Spanish-English dictionary was getting dreadfully out of date, particularly with respect to information technology, so enter the Oxford Spanish Dictionary, or rather the Gran Diccionario Oxford. The books are identical except for the covers, but by some mystery of marketing the edition with the Spanish title is $9 cheaper in Canada, so that’s what I got. It is quite an improvement over my last dictionary, with large headwords in blue that are easy to scan, various bubbles and boxes with subheadings to break up large entries, lots of examples of words in use, and sidebars with helpful cultural information. The introduction states that the purpose of the book is help everyone participate intellectually in the development of the world and the debates of the day, as well as access the wealth of human knowledge in an enjoyable way. It is indeed very up-to-date and enjoyable to flip through (see pages from an older edition here). The only caveat is that the typeface is extremely small. Clearly this is meant for young eyes, and really there’s no other way to cram this much information into a single volume. This edition also has a slight flaw in that some of the index pages are printed in grey rather than black; it is perfectly legible but may explain the bargain price of the book. 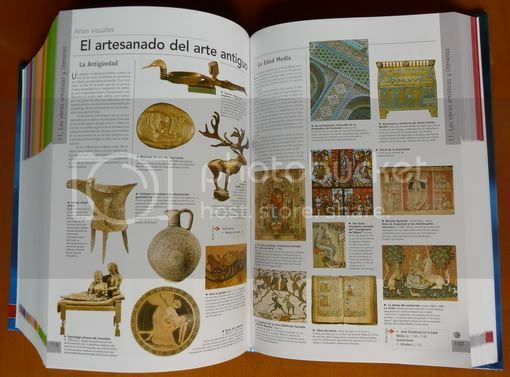 I also noticed that they included an ad for El Pequeño Larousse Ilustrado, their encyclopedic dictionary, in the section on marketing—sneaky! British readers may chuckle at the name “Quod,” which is mean to signify who, what, when, where and why, but in Britain is slang for prison. Perhaps for this reason Larousse has renamed the book Larousse Pequeña Enciclopedia for 2010, though the book isn’t available yet. Their companion website is also unavailable, which makes me wonder if they are struggling just as other encyclopedia publishers are. Perhaps the days of randomly flipping through an encyclopedia are coming to an end. Searching online may be more efficient, but it lacks something as a relaxing pastime—it’s hunting, rather than fishing. Sometimes you just want an excuse to sit and muse for a while, and a little encyclopedia like this is just perfect for that. Ever since I was a little kid I’ve had a thing for reference books. I remember flipping through my mom’s books of accounting tables and my dad’s “Rubber Bible” (Handbook of Chemistry and Physics) before I had any idea of what they contained. Later I spent many happy times flipping through our Columbia Encyclopedia and National Geographic World Atlas. Even now that the web has become the ultimate reference, my hankering for giant tomes of knowledge has not abated. Pound for pound and dollar for dollar, most of the books I buy are reference books. So, while shopping for an updated Spanish-English dictionary (my old one doesn’t even have an entry for “Internet”), I stumbled across some delightful reference works from Larousse. 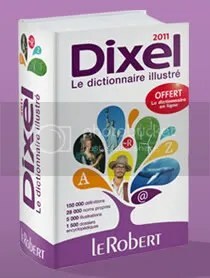 I already have two Larousse French-English dictionaries, including the “advanced” dictionary, their largest. It is the thickest book I own, with a sturdy convex spine that seems well able to take the weight of all 2,300+ pages. Inside it has large, easy to scan headwords, extra organization for long entries, boxes with additional information on important topics (mostly historical and geographic), and a bilingual “cultural supplement,” an illustrated guide to French and English literature, art, and architecture, with additional pages on transportation, sports, technology, nature, and geography. This latter section follows in the tradition of illustrated Larousse dictionaries and encyclopedias, which I have only just come to appreciate. I do have an old 1980 petit Larousse en couleurs (yes, it’s capitalized, or rather, not capitalized that way), an illustrated encyclopedic dictionary only marginally thinner than my big Larousse dictionary. Perhaps I should call it a dictionary-encyclopedia because it has two sections, one for vocabulary, the other for people, places, and works of art (the first entry in the encylopedia section is Proust’s À la recherche du temps perdu). It is illustrated throughout, which makes for enjoyable flipping even if I don’t understand every word of the definitions. Opening of petit Larousse en couleurs showing illustrations for “Impressionisme” and “imprimerie”. I found it amusing that such a large book (it weighs over 6 pounds) was called “petit,” but have since learned that this is in comparison to the Grand Dictionnaire Encyclopédique Larousse, a ten-volume encyclopedic dictionary last published in the 1980’s, and the earlier 17-volume Grand Dictionnaire Universel du XIX Siècle compiled by Pierre Larousse himself. These are not the Petit Larousse’s only big brothers, however. Intermediate in size is the Grand Usuel Larousse, a five-volume “every day” slipcased paperback encyclopedic dictionary and atlas. Based on the 1987 Grand Larousse en 5 volumes, this set was published in 1997 and is now out of print. 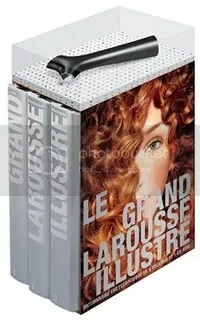 Smaller still is the Grand Larousse Illustré, a three-volume set published in 2005. This work really fascinates me because it had the option (only available in Europe, it seems) of automatically linking articles in the paper volumes to multimedia resources in the companion CD-ROM. It did this by way of small graphical codes printed with the text that could be read with a wireless USB scanner. Scanning one of these “chips” launched the CD-ROM on your computer and brought up the relevant material. This seems like a remarkable innovation, especially for 2005. Stefanie recently blogged about QR codes in books, which can be scanned with a cell phone to view relevant mobile web pages, but so far only one book has been published with this technology. Larousse, which has always been a progressive publisher, was once again ahead of its time. 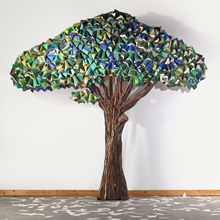 Could this breathe new life into the paper encyclopedia? Alas, even the high-tech Grand Larousse Illustré is out of print, and Larousse has moved its reference material online. Only the Petit Larousse is alive and well after 105 years in print, with new editions every year in French and Spanish. 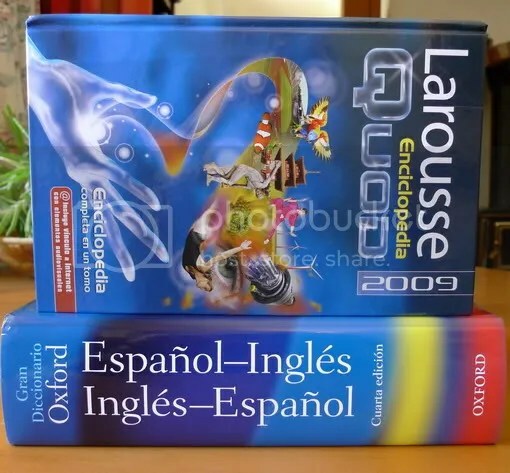 Larousse Mexico also publishes the Larousse Enciclopedia Quod, an illustrated encyclopedia in Spanish arranged by subject, more like a textbook about everything than an A–Z encyclopedia. For some reason, Amazon is selling the 2009 Quod (list price $43.50) for a mere $3.08. Is it a typo or are the gods of reference books smiling on me (and not for the first time)? Who cares, I’ll take it! The Oxford Companion to the Book. Two volumes, 1408 pages, a million words, 6 glorious kilograms on our favourite subject. See more details here. Let the drooling begin. Just as it was not good for Adam to be alone in the world, so it was not good for the OED to be the solitary representative of the English language on Earth. 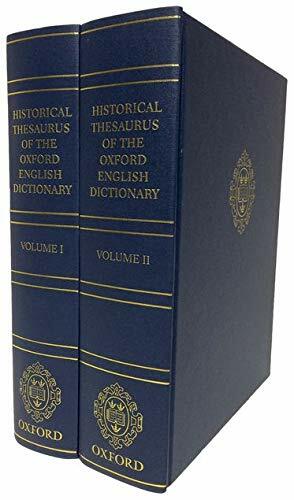 After nearly 45 years of taking the ribs out of the OED and sorting them by kind, a group of dedicated philologists have created the perfect mate for the OED, the Historical Thesaurus of the Oxford English Dictionary (available at Amazon). Naturally it is the largest thesaurus ever produced, and the only historical thesaurus in any language. It contains all of the OED entries up to the second edition additions (they had to stop somewhere!) and is arranged semantically by a structure created specifically for this project. I’m sure half the pleasure of the HTOED is browsing through the categories of words, but if you are looking for something in particular, there is an alphabetical index volume to go with the thesaurus. Together they form a two-volume boxed set that is about the same size as the Shorter Oxford English Dictionary. I think they would look quite handsome on the shelf together. I think it is a good sign, in these days of e-books and online references, that Oxford has published this monumental thesaurus in book form. I will most definitely be saving up my pennies to get my own copy! Find out more about the HTOED and see a sample page here. I’ve always considered myself something of a dictionary-lover. I have half a dozen English dictionaries, ranging in size from pocketbook to tombstone, all strategically located for specific applications. The smallest ones, both from the 50’s to capture older literary words, are next to my bed for novel-reading. A chunky little Concise Oxford from 1964 does duty in my lectory, and a Merriam-Webster’s Collegiate stands by my study desk. Finally, by my computer desk I have a Canadian Oxford and my big guns, the two-volume Shorter Oxford English Dictionary (all words used since 1700 plus Shakespeare, Milton, Spenser, and the KJV). As it turns out, my regard for and collection of dictionaries is minuscule compared to those of Ammon Shea. He has about a thousand dictionaries (and related books) stuffed in his New York apartment, and has actually read a number of his dictionaries, cover to cover. Dictionaries are simply the love of his life. Obviously, an obsession like that could only lead to one place: the Oxford English Dictionary. Sure enough, he spent a year reading the entire 20-volume OED, and has recounted his journey in Reading the OED: One Man, One Year, 21,730 Pages. The book consists of one chapter for each letter of the English alphabet, with a short section of prose and a selection of his favourite words from that letter. Shea writes about the OED, his love of dictionaries, and the trials of reading the OED. It takes until G to find a quiet-enough place to read (basement of a college library), and he gets such regular headaches that he comes to regard them as pleasantly familiar reading companions. The headaches abate somewhat after he breaks down and gets glasses, but his task is no less gruelling thereafter. Fuelled by gallons of coffee, he reads for something like 10 hours a day. I don’t think I could read the most engaging novels for that length of time, let alone a dictionary. The best I’ve done is read the Bible for three hours a day one Lent. Pretty paltry compared to Shea’s year-long odyssey. I must admit I was rather disappointed with the lexicon he collected for this book. For one thing, the only information you get about each word is a short definition. There is no etymology, unless he mentions it in his annotations, and apparently copyright concerns prevented him from including any text from the actual OED, including the literary references that are its hallmark. It seems pretty short-sighted of Oxford not to allow quotations from the OED in what is more or less a book-length advertisement for it. Have you ever heard of a book about another book without any quotations? That is what we have here, and it means that the reader doesn’t really get any of the OED experience. It’s an opportunity lost, I think. My other disappointment with the word lists is that like A.J. Jacobs, who read the Encyclopaedia Britannica, Shea devotes altogether too much attention to the things that make teenage boys giggle. He has already co-authored a book on obscure naughty words, but apparently that wasn’t enough. Not a letter went by without references to various bodily functions, and drunkenness and raunch were much in evidence also. I could have done without it. Overall the book is light and breezy (if New York misanthropy can be light and breezy) and a very quick read. In a way it is not really for the established dictionary enthusiast. There is almost no discussion of the kind of technical work that goes into a dictionary, or indeed on the specific content of the OED. He touches on the subject when he discusses “set,” the word with the longest entry in the OED, but that’s about it. This is not a book that will tell you much about dictionaries or the OED, though Shea does provide a short bibliography with books that will. For Shea it seems the journey is the destination. He simply enjoys reading dictionaries. No sooner had he finished reading the OED than he decided to read it again, this time without a deadline, allowing himself to look up intriguing cross-references or literary quotations. I think he might have produced a more substantial book if he had done that the first time around, but that is probably not what publishers are looking for. Feats of strength sell better than thoughtful sauntering. I guess it is up to us to do our own thoughtful sauntering.